Once was one of my most anticipated sequels in 2012, because the ending of Eve nearly killed me and while I didn't like it as much as I liked Eve, I still really enjoyed it! We pick up a little after where we left Eve in the first book, she's just gotten settled in at Califia, but she can't forget about Caleb. I was actually kind of surprised it had taken her that long to start considering leaving Califia to go to him. If my boyfriend had been out there on his own, hurt, possibly dying, I don't think I would have lasted a day there. I was glad to see Eve grow up somewhat throughout this novel, she's definitely not the naive girl that we met in the first book anymore and she's learned to fend for herself a little, even if she still feels a bit like a damsel in distress to me. It kind of bugged me that most of the 'heroics' she undertakes are guided by other people and not so much by her own taking care of business. And you guys, Caleb!! I adored the boy in Eve and I my heart started fluttering again when he stepped into the story! I was kinda sad we don't get a lot of time with him, but those moments he's there are magical. Most of Once, while entertaining, felt like a bit of a filler towards Rise, in which I imagine the epic showdown will happen. It wasn't until the last quarter of the book that I was fully engrossed and on the edge of my seat with a sense of foreboding that was justified. I did really like the plot twists that were thrown in, especially one pretty early on that I will not spoil here, but SO GOOD! 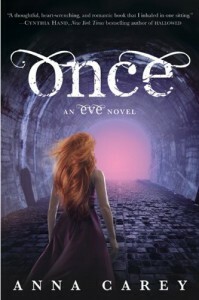 So while Once for me suffered a bit from second-book-syndrome, Anna Carey has a way of storytelling that made me still want to keep reading and just like she did with Eve, the ending of Once nearly killed me and I just need Rise RIGHT NOW!